Learn how you can use Shadow Archive to easily copy your RetSoft archive to a target folder of your choice, so you can switch to a different system at any time. Shadow Archive is one of the modules that can be added to RetSoft. It allows you to copy your RetSoft Archive to a target folder of your choice. If you want to stop using RetSoft at a certain time, you can use Shadow Archive to easily export the RetSoft Archive while keeping the same folder structure. This means you can switch to a different system at any time. Once you have opened RetSoft, you have access to Shadow Archive via the menu bar. It is quite easy to use Shadow Archive. When you have clicked on Shadow Archive, you will see the notification below. It will tell you which file format will be used to save your exported documents. After you have clicked on Continue, a window will appear and you can indicate where your target folder is located. This could, for example, be a local folder, a folder on a network hard drive or a folder on a server. You can also indicate whether the meta data should be exported and whether you only want to process changes in the archive. When everything is set up, you can click on Start. The entire archive will then be exported to the location indicated by you. 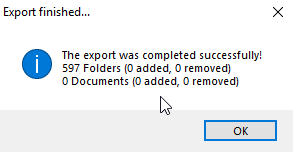 Once the export is completed, a notification will appear that shows information about the export.